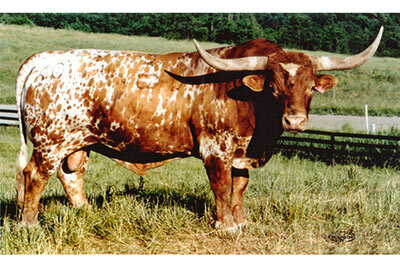 He is the leading Longhorn sire of thickness. Many use Gizmo to add substance, color, and milk production to herds. He is sired by Zhivago and out of Blazon by Jet Jockey. Blazon is out of Rose Blade by Don Abraham and out of Ranger's Rose by Texas Ranger, out of the famous Butler cow Rose Red. This blend pedigree combines the greats of the breed. Those desiring thickness and rich red appaloosa color go for Gizmo. Gizmo is the sire of International Champions Paladin, Winchester, Remington, Detonator, Legacy ITLA Champion, Gizette and numerous beef type and colorful progeny. He weighed 2120 off cows in his prime. He sires more thickness than any bull used by DCCI. See him on You Tube.